After submitting all the appropriate documents necessary to become a patient of Dr Donovan, all new qualifying patients are given an appointment time and date and then begin with a 35-40 minute comprehensive consultation. Comprehensive consultations allow Dr. Donovan to thoroughly assess a patient's medical history, and to understand the reasons for a given patient's hair loss. By the end of the first appointment, the patient will have an understanding of the diagnosis, prognosis and treatment for their hair loss. 1) The Diagnosis. What's causing my hair loss? 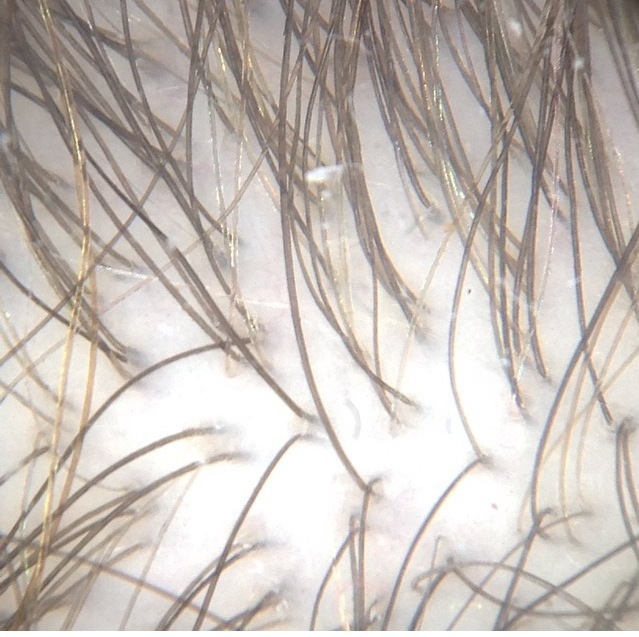 By carefully reviewing each patient's history himself, and examining the scalp with use of dermoscopy, Dr. Donovan can usually provide patients with the reason they are losing hair. Rarely, a scalp biopsy may also be needed along with more extensive blood tests. There are dozens of reasons to lose hair, and many conditions can look surprisingly similar. In our view, getting to the right diagnosis is critically important and anything less shortchanges the patient of the potential to improve his or her hair. At the Donovan Hair Clinic, this critical step in the process is the responsibility of only one person - Dr Donovan. Comprehensive consultations allow a patient to gain an understanding of the reason for his or her hair loss. 2) The Prognosis. What is likely to happen to my hair in the future? Some hair loss conditions are temporary in nature and improve with or without treatment. Other types of hair loss are chronic (long term) and may get slowly or rapidly worse over time. Some conditions can be helped a great deal with treatment, other types of hair loss can be helped to a certain degree with treatment but possibly not completely. Comprehensive consultations allow a patient to gain an understanding the prognosis of his or her hair loss (likelihood of future hair loss and speed of progression). 3) The Treatment. How should I treatment my hair loss at this point? The first step in determining which treatment is appropriate is determining the precise diagnosis (step 1 above). The Donovan Hair Clinic strongly believes there is no "one treatment fits all" model when it comes to hair loss. A wide variety of treatments are available for individuals with hair loss, but the correct and appropriate treatment depends entirely on the diagnosis. Comprehensive consultations provide patients with an understanding of all the treatments that are available, their side effects - and what is the best 'next step' for the particular patient. These may include non-surgical, surgical and cosmetic treatments. We may initiate very different treatments for a patient who comes to us very early on in their hair loss compared to patients who come to us having visited many physicians and used many previous treatments. For some patients with hair loss, our clinic serves as a starting point en route to treating their hair loss. Some patients stay with us as long term patients and others return to their primary dermatologist, family physician or hair transplant surgeon for long-term care. For other patients, our clinic serves as a one visit 'second opinion' consultation visit - whereby patients meet with Dr. Donovan to fine-tune their current management plan before returning back to their current physician. For other patients, our clinic is an internationally recognized final stop after having tried many previous standard treatments. We treat patients with some of the most complex presentations of hair loss. Whatever the reason, we understand hair loss treatments and which ones are appropriate at each stage. The Donovan Hair Clinic functions primarily as a non-surgical clinic. Treatments offered by Dr. Donovan include only those with clinical evidence of being effective - including prescription medications, non-prescription (i.e. over the counter), herbal therapies, aromatherapy, laser treatments and platelet rich plasma treatments. Dr. Donovan no longer performs hair transplantation or scalp micro pigmentation (SMP) procedures but has vast knowledge and experience in these areas to refer patients to other colleagues worldwide when appropriate. Similarly, Dr. Donovan has vast experience in counselling patients about wigs, hair pieces and hair systems and may advise this as an option for some patients and refer to appropriate specialists. Please review our Top 100 Frequently Asked Questions to review commonly asked questions about setting up an appointment with Dr. Donovan. The easiest way to book an appointment is to complete the BOOK A CONSULT form. Our office will review your request very quickly and respond to you by your preferred method of communication (i.e email or phone). Do I require a referral from my doctor or dermatologist? A referral from a physician is not required as we are a private clinic. However, should your physician wish to send us an introductory note, it is certainly appreciated. Dr. Donovan will forward them a copy of your consultation note at the end of your appointment. 1) FILL OUT THE PATIENT QUESTIONNAIRE. We require ALL patients to complete our pre-visit questionnaire at least ONE MONTH prior to their appointment. The questionnaire is for your benefit and we require all patients to complete it. 2) BRING A LIST OF MEDICATIONS. Please bring a list of all medications used in the past 2 years, including prescription and non-prescription medications. 3) PREPARE YOUR PREVIOUS PHOTOS. Please bring photos (if possible) from 1 year prior and 5 years prior. 4) SEND OUR OFFICE YOUR BLOOD TESTS. We encourage patients to have blood tests done BEFORE their appointment. Dr. Donovan strongly believes that every person with concerns about hair loss should generally have tests for iron status (ferritin) and thyroid done as a minimum. Other tests may be needed as well. For more information on the blood tests we generally recommend as appropriate baseline screening for individuals with hair loss please click the link: Baseline blood tests. If you have not had blood tests done, you might consider completing your basic hair loss work up with your physician. If it's not possible for you, please let us know and we will review if it’s possible to waive this requirement or not. In some (rare) cases, Dr. Donovan may accept you as a patient and order blood tests after meeting with you. However, please keep in mind there are fees associated with these tests ordered through our office. 5) REVIEW OUR CLINIC POLICIES. We encourage patients to review our clinic policies on booking appointments, cancelling appointments, follow up appointments, and how our clinic functions. You might wish to review our policies on renewing prescriptions as well as the typical frequency of follow up appointments. 6) REVIEW OUR LIST OF OVER 100 FREQUENTLY ASKED QUESTIONS. We have a list of common questions patients have asked regarding their first appointment as well as questions they have about future appointments. Please take the time of review these as you will likely find it extremely helpful. Frequently Asked Questions (100 FAQs) About the First Appointment. Frequently Asked Questions About the Second Appointment. What should I do after I leave the office? 2) Complete any additional blood tests that were recommended. If you have been asked to do additional blood tests, please get these done when Dr. Donovan advised. Dr. Donovan will review them and get back if there are abnormalities or concerns. Please give us 3 weeks following completion of your blood tests to respond to you with any abnormalities. 3) Fill any prescriptions were given to you. If you were prescribed any medicines, you may wish to fill these prescriptions. Prescriptions from Dr. Donovan are valid in Canada. Patients from outside of Canada may fill prescriptions in Canada before leaving. However, many patients return to their own physicians in their countries to review the treatment plan and have their local physicians prescribe the medications. These prescriptions will be valid until the next follow up appointment. Please take note that prescriptions are not renewed by the office indefinitely. You might wish to review our policy on prescription renewals if anything is not clear. 4) Arrange your next appointment. If you are booking your next follow up with Dr. Donovan at the Whistler office, be sure to book your next appointment as soon as possible so as to get the appointment time your want. If you will be seeing your own doctor in follow up, consider reaching out to their office to book a follow up appointment. The typical interval for follow up appointments can be found in the following link, FOLLOW UP INTERVALS, but you need not worry about the specific intervals as Dr. Donovan will advise you of this at the time of your appointment. 5) Provide us with feedback. We would appreciate if you take the time after your visit to complete our Post-visit Evaluation of your visit. This is anonymous and provides us with helpful feedback. Most patients in our practice return for a second visit at some time interval after their first appointment. The frequency of follow up appointments depends on the diagnosis the patient receives. For example, some patients with alopecia areata may be seen for "steroid injections" every 6-8 weeks. Those not receiving steroid injections may return every 3-6 months depending on the specific treatment they are using. Individuals with scarring alopecia are often reevaluated by Dr. Donovan every 3-6 months. 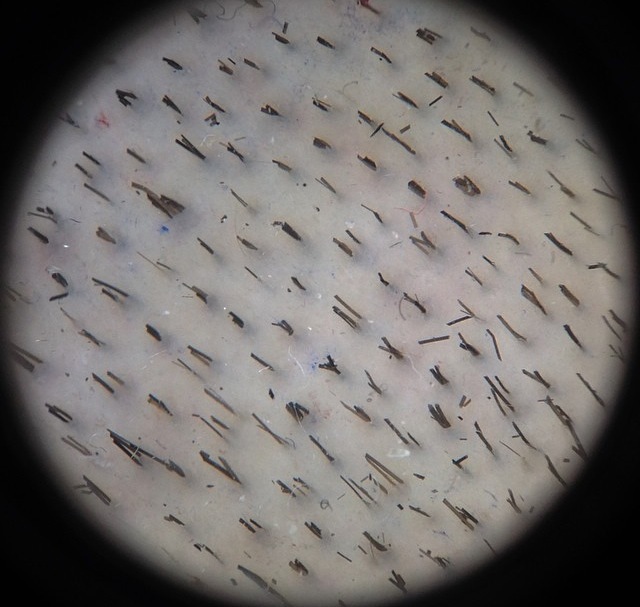 Patients with hair shedding issues, and androgenetic alopecia are typically seen every 9-15 months. Our office sees patients from around the world. Some patients travel from long distances for their first visit and may elect to arrange their "follow up" appointments through their local dermatologist, hair transplant surgeon or trichologist. Others have their follow up appointments done with Dr. Donovan via skype or phone consultations and check in at the office every 2-3 years. All patients from outside of the Whistler, BC area wanting to become long term patients of Dr. Donovan must be seen at the clinic for a first appointment. Only patients requesting a one-time "second opinion" on their management are candidates for an initial Skype/phone consultation. The specific requirements for "second opinion" consultations can be found in the following link. *** Effective June 2016, Dr. Donovan is no longer accepting new patients for hair transplantation at the Whistler office. The Whistler centre has transitioned itself into an international hair loss and hair research centre focussed entirely the non-surgical management of hair loss. Consultations at the Whistler office provide patients with comprehensive diagnostic and treatment recommendations. These treatment recommendations may include non surgical recommendations, surgical (hair transplantation) recommendations and cosmetic recommendations. However, patients deemed good candidates for hair transplantation will be referred to other local and international surgeons for performing the hair transplant surgery. Likewise, patients deemed good candidates for cosmetic options such as scalp micro pigmentation or use of wigs, hairpieces or hair systems will be referred elsewhere.